A standard performance lasts approximately three hours and consists of three one-hour sets (including breaks between sets). Shorter or longer performances are possible by special arrangement. We provide recorded music to keep your party hopping during our breaks. BNO has approximately 13 members, plus sound reinforcement equipment, and requires a minimum stage area of 24 feet wide by 16 feet deep. You can see our detailed stage requirements below. We typically play in the Oak Ridge/Knoxville, Tennessee area, but have also performed in the Nashville, Chattanooga, Tri-Cities, and Atlanta areas. Longer trips are not out of the question, given adequate compensation. Many of us have day jobs, so most performances are on Friday or Saturday nights. Cost will be determined by the type of event, date, travel distance, and other factors. We specialize in large public performances, charity events, wedding receptions, office parties, and similar affairs. Equipment: We generally provide our own sound reinforcement equipment and lights. If sound and lights are to be provided by the performance venue, or if we will be sharing the stage with other performers and their equipment, we can work with that, but we'll need to know in advance so that appropriate arrangements can be made. 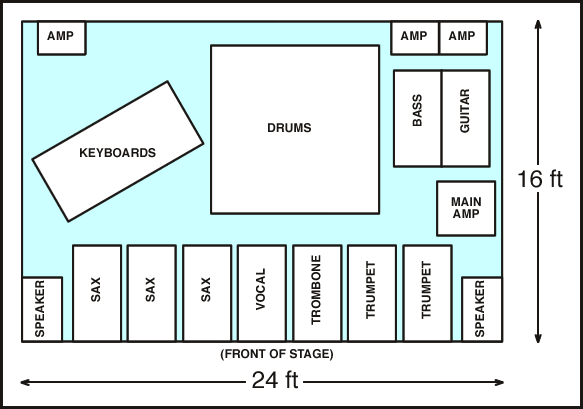 Stage Area: We require a minimum of 24 ft. wide by 16 ft. deep, and we must have this minimum stage size in order to accommodate our sound system, our band members, and their equipment. Please check with the performance venue to ensure that sufficient stage area is available. If it is not, please contact us as soon as possible so that we can make alternate arrangements. We prefer a raised stage (stage risers), if available. Electrical: We require three separate 20 Amp circuits. Please check with the performance venue to ensure that sufficient electrical power is available. Setup Time: We require approximately four hours to set up the band. If less than four hours is available, please let us know, as we may need to make arrangements for extra personnel in the setup crew. Stage Access: As we have over 1500 pounds of equipment which must be carried onto the stage, we very much prefer a short-distance, easy-access route from the stage to a parking area or loading dock. If equipment must be carried up more than one flight of stairs, and no elevator is available, please let us know in advance, as we may need to make arrangements for extra personnel to haul the equipment. Sound Crew: The Sound Technician and his crew will require a table approximately 6 feet wide, and three chairs, to be placed somewhere out in the room in front of the band. Exact position to be determined at setup time.